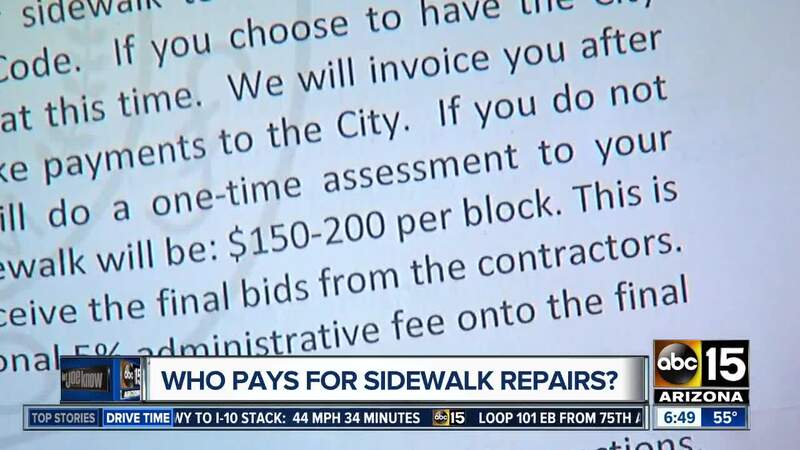 Let Joe Know helps you determine who is responsible for payment of sidewalk repairs. PHOENIX — A lot of us have cracked sidewalks in front of our houses. Sometimes, there's even more damage. In many cases, the sidewalks near and parallel to the street are city property. But, more cities are making homeowners responsible for sidewalk repairs. Phoenix and Tucson both have ordinances that put responsibility on owners. Flagstaff will split the costs in many cases. Mesa tells me the city is responsible for repairs to sidewalks near the street. But they and other cities are not responsible for sidewalks that run closer to the house, possibly to the front door, and not on city property. Even though the ordinances are pretty clear, it seems there are gray areas. So before you request or pay for repairs, contact your city and ask who has to pay.